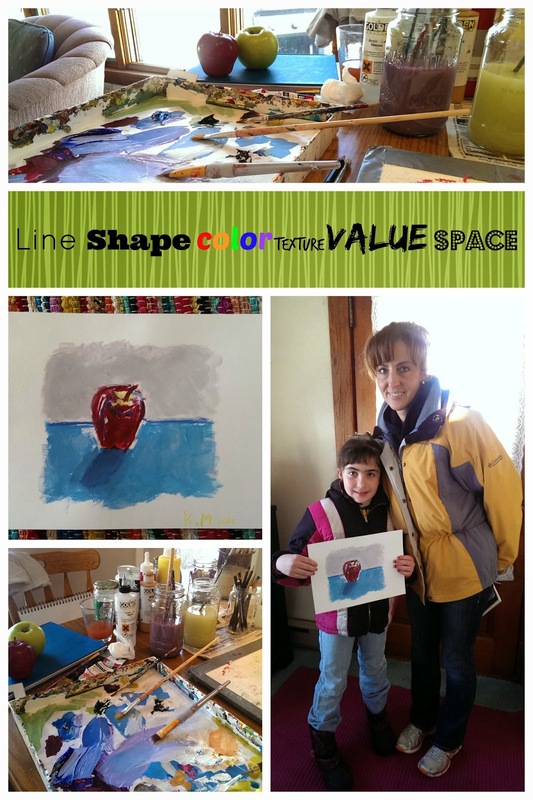 Last weekend, I had the chance to paint with a very talented young artist. We started by talking about the elements and principles of design and how they are used to create an interesting composition. Studying color relationships, we focused on recognizing the various colors in the highlights and shadows. While aware of our elements and principles of design, we used everyday subjects (an apple and book) with a minimal background to create a fun, contemporary composition. Recognizing the beauty and interest in the mundane is an artist's forte. Katie created a lively expressive painting using bold brushstrokes and custom colors. I particularly like the rough edges around the apple and the outer edge of the composition. This along with the repetition of shapes, the color palette, and the positioning of the apple create contrast, harmony, and balance in the overall work. Katie, thanks for letting me share your cool painting! Art On! 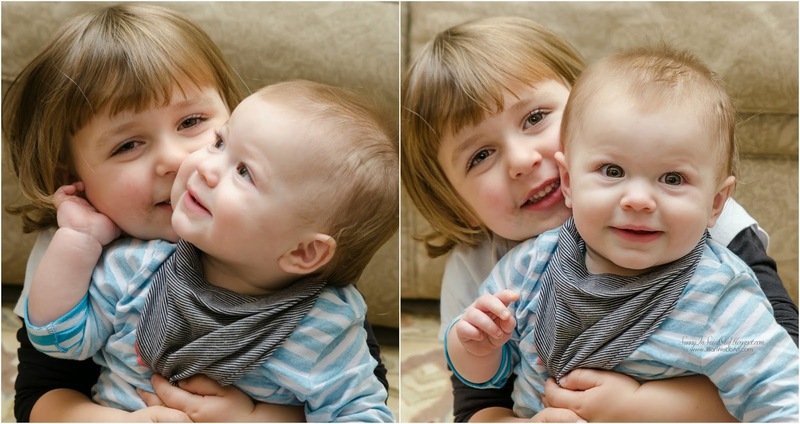 I'm finally getting around to sharing a few photos that Zach and I took over Christmas. We were so excited to go home for the holidays, even if it meant a 999.9 mile drive across the country. The long ride gave us plenty of time to talk, joke, listen to music, and even make a bet or two. Halfway home, I bet that if I simply started doing yoga in the living room in front of our niece, she would join right in and love it. Zach didn't think she would. Guess who won that bet!?! So glad Zach was there to catch our impromptu living room yoga session! and especially cherished the quality time playing with our nieces. 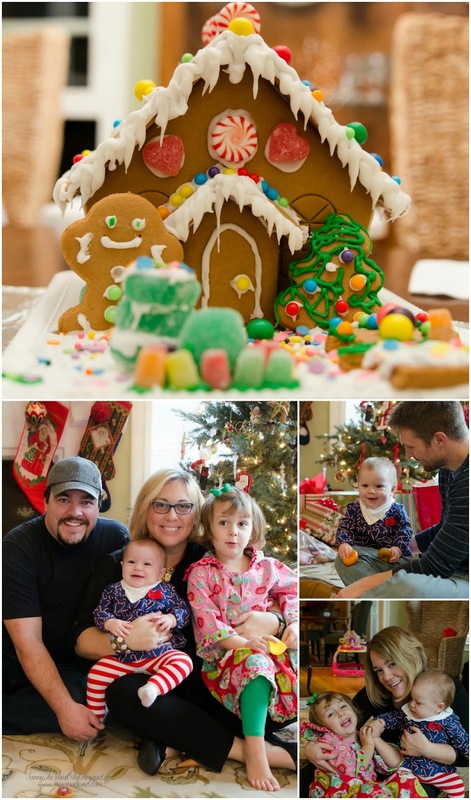 We built a gingerbread village, played dress-up, baked cookies for Santa, read lots of books, and pretended to eat tons of play-food from "Annika's delicious living room restaurant." The day after Christmas, Zach and I drove down to South Carolina, where we celebrated the holidays with my grandparents, cousins, aunts and uncles. 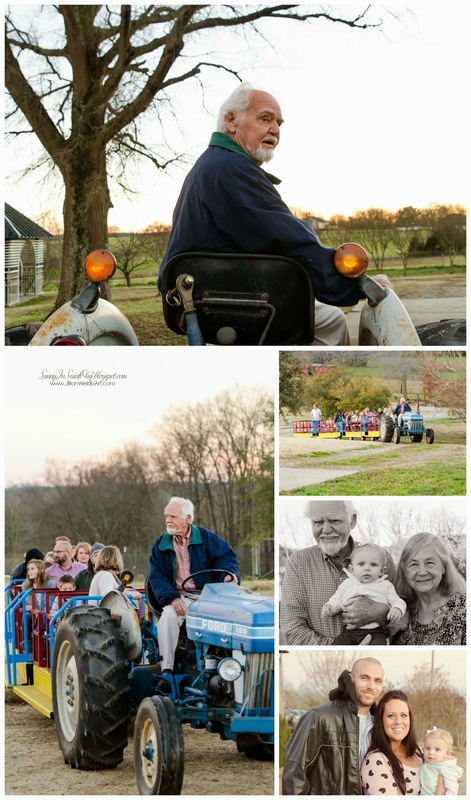 We couldn't believe what we saw when we pulled up to Grandma and Grandpa's house... Grandpa had acquired a "train" and had been giving rides around the yard! Who doesn't love a train ride?! After Christmas with the extended family, we drove to Myrtle Beach to spend a few days ocean-side with Mom and Dad Herrmann and close family friends, the Musselmans. We shopped, played dominoes, and watched a silly movie. Sunday, the Grahams came down for a day and we got to spend time with Lily! She's grown up so much since we saw her last March. Although she's still quite tiny, she sure is spunky, wide-eyed, and on the move! Happy ONE year to our favorite little Graham-Cracker! So blessed to have such a wonderful family and friends, time together over the holidays, and the technology to keep-in-touch all of the days in-between! Today, I share with you... Mom's fabulous Lane Cake. Last month, Zach and I drove back east for Christmas. We were so grateful and excited to spend time with family and friends for the holidays. One of the first things I did when I got home was help Mom make a Lane cake. My brother always requests Lane Cake and it's one of Dad's favorites, too. This Lane Cake meant that my brother and sis-in-law and sweet little nieces would be arriving the next day! I knew Mom was excited to be baking because it was Christmas and her family was all coming home! 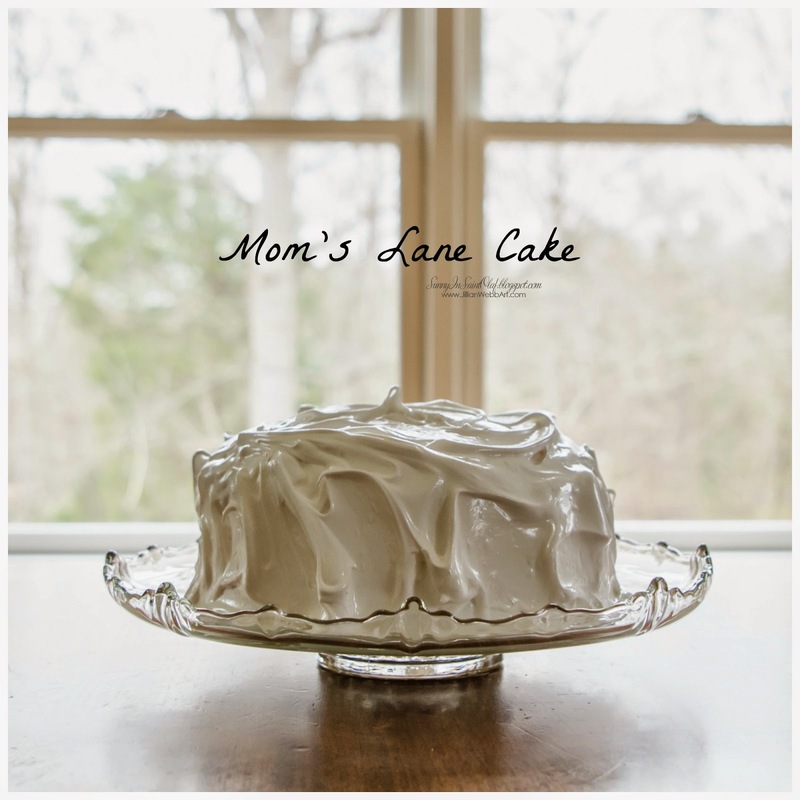 So, I love Lane Cake because not only is it delicious, but it also reminds me of family. I am aware that Lane Cake has been around for ages; I'm not 100 percent sure where this recipe originally came from, but mom gave me her permission to share it with you. 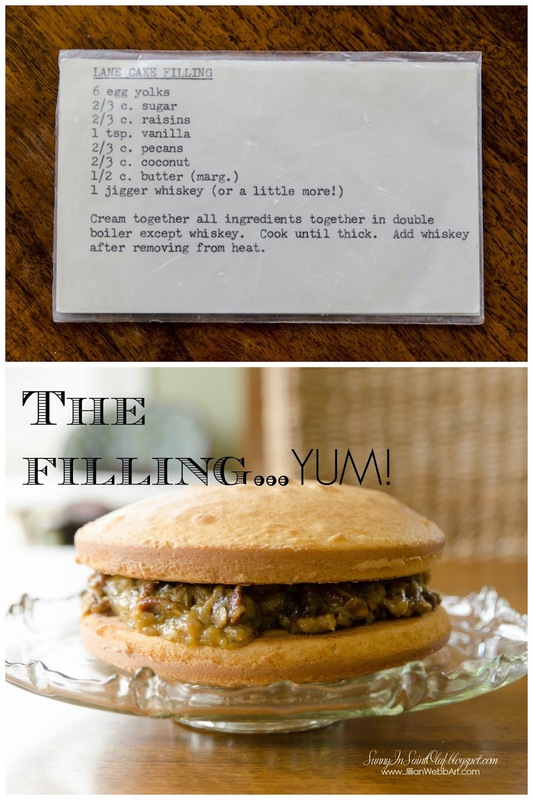 Mom said she's been using this recipe for forty years, and she thinks this version of Lane Cake was a recipe from her friend, Elaine. Wherever it came from, it's fantastic and has always been a favorite in our house! I'll let you in on a little secret, I use cake mix from the box 9 times out of 10. It's delicious! I don't always have time to do everything from scratch and I have no shame in saying so. So, when it comes to cakes, cupcakes, etc, I focus on the icing. Besides, what makes Mom's Lane Cake so special is that filling and frosting. 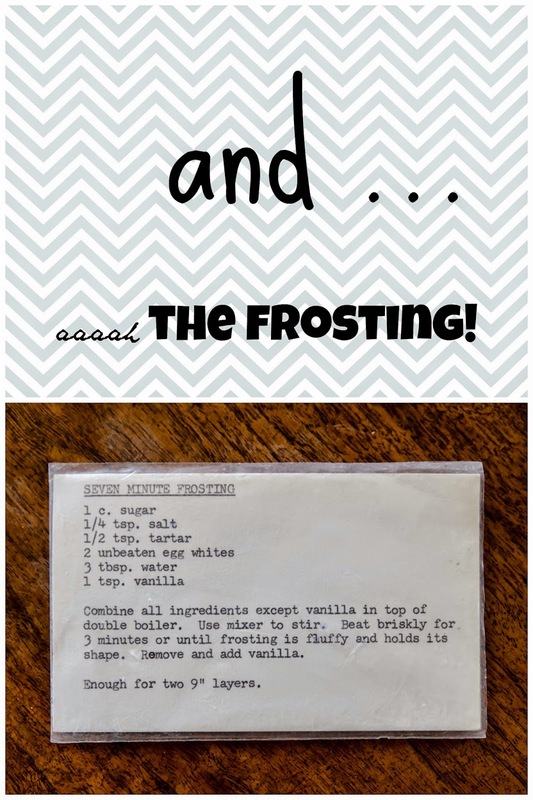 Mom uses a traditional seven-minute frosting, which is light, fluffy, and perfectly compliments the thick, sweet, whiskey filling. 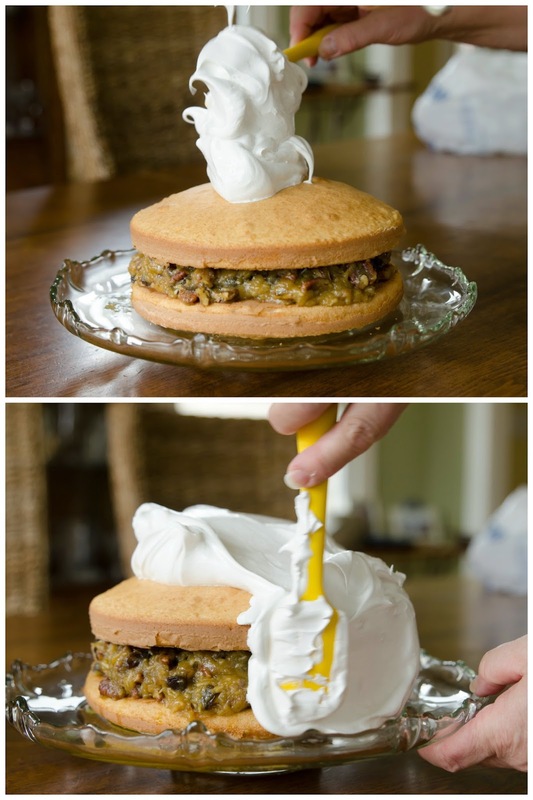 Dump the thick nutty, gooey, whiskey filling on top of your first layer and cover with the second cake layer. 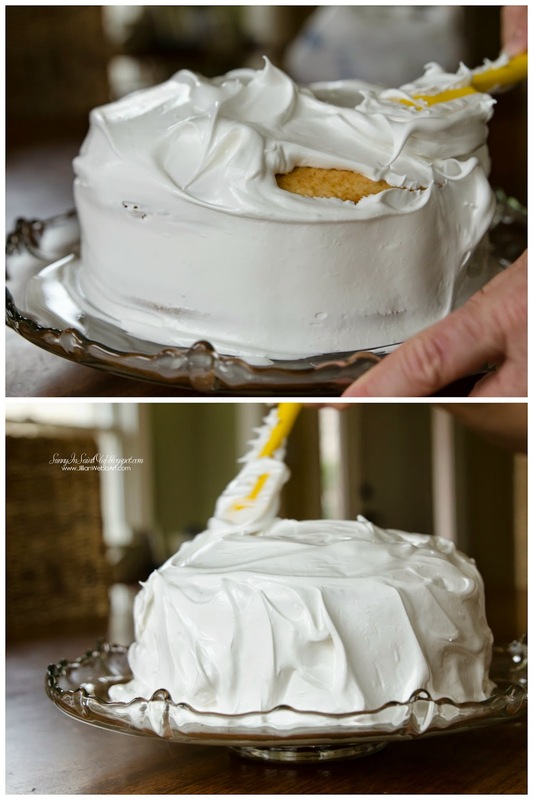 Last, cover the cake with frosting and be sure to bring your frosting all of the way down to the cake plate--sealing the cake to the plate underneath your frosting. Be on the look out for my homemade whipped cream topping! Do you remember those gorgeous sunset beach photos that I shared with you on a cold snowy day back in November? 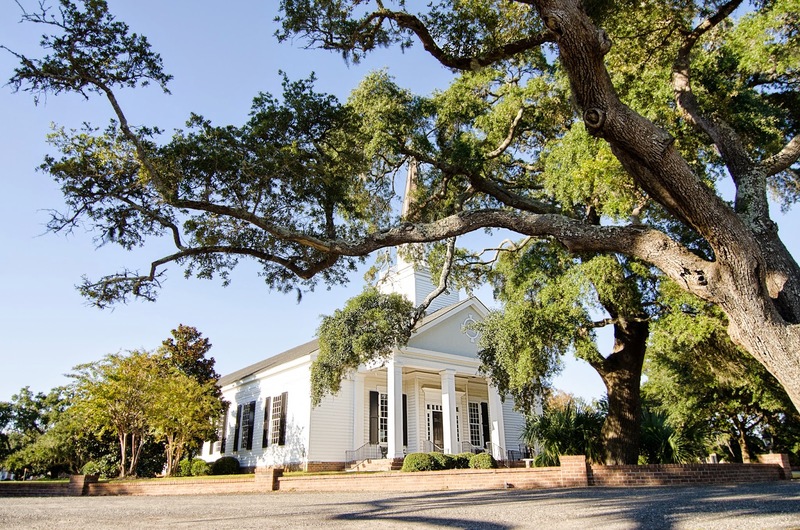 Since it's been snowing all day in Saint Olaf with temperatures in the negative, I thought it would be a nice night to warm up with Andy and Leslie's sunny South Carolina wedding photos! This past October, Zach and I traveled south to document Andy and Leslie's intimate Murrells Inlet wedding day. We flew into Myrtle Beach a few days before the wedding, giving us time to spend with family and to scout the venue before the ceremony. The church was stunning. Leslie told me they planned to get married on the back steps, surrounded by the huge old trees overlooking beautiful Murrells Inlet. Just pulling up to the spot where my sweet cousin would say "I do," I literally got chill-bumps from excitement (that's what we call goosebumps in the south)! I couldn't wait to watch Leslie marry the man of her dreams--and yes, Andy is totally dreamy! I was pretty sure I'd need a thousand tissues to get through the ceremony, as just walking around the location beforehand was making me misty-eyed! I loved that Leslie's daughters helped her get ready on her wedding day; Avery helped with hair and make-up, and Alli picked out and arranged all of the flowers. They both did such an amazing job and I know Leslie is so proud of the beautiful young women they've grown up to be. While I was with the bride, Zach spent some time with the groom before the ceremony. 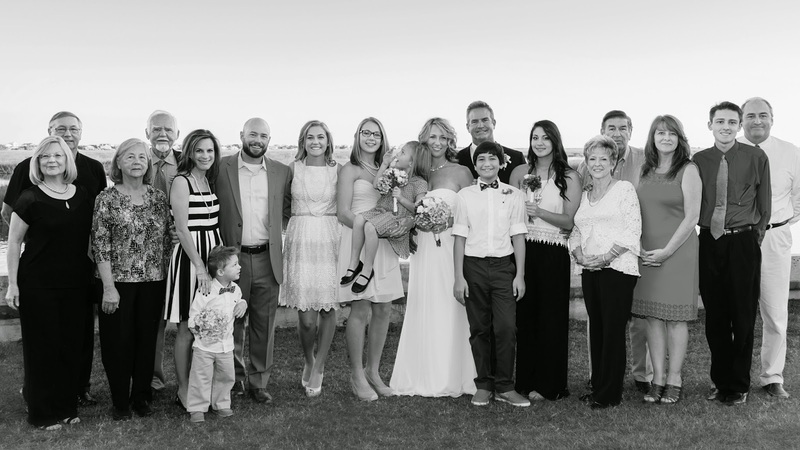 We're so happy to have these amazing people join our big happy family! ...and they said, "I do." and couldn't be more excited for you both! to be easier on myself.